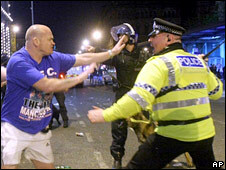 Rangers supporters in Manchester for the Uefa Cup final clashed with riot police after a big screen in the city centre broke down. Officers came under attack after the screen in Piccadilly Gardens failed. An estimated 100,000 fans descended on the city to see the match, which Zenit St Petersburg won 2-0. Sir Richard Leese, leader of Manchester City Council, said "the finger of blame" pointed at fans, rather than with one of the big screens breaking down. "I think it would be a real mistake for what was a very very small minority of Rangers fans to say that their behaviour can be excused by a technical problem with a screen. "If we are going to put a finger of blame anywhere it has to be with those fans having to take responsibility for their own behaviour." He said there would be a full council inquiry into the failing of the Piccadilly Gardens screen. The injured Russian fan was taken to hospital after he was attacked in a seated area of the stadium before the start of the game. He was stabbed in the back but his injuries were not reported to be life threatening. 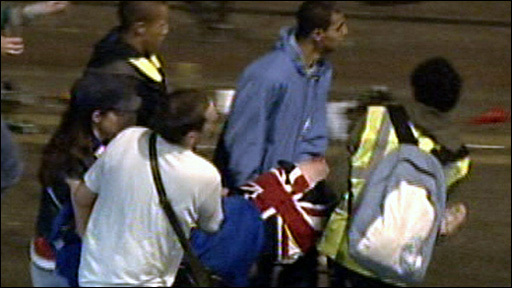 Six men, all believed to be Rangers fans, were arrested in connection with the incident, said Greater Manchester Police. Groups of supporters clashed with police in Manchester city centre, where damage was caused to a bank, bus stops and a sports car which was bounced across a road. 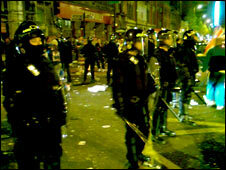 "But I'm really disappointed that has been spoiled by pockets of disorder that have broken out in the city centre. "A minority of thugs have overshadowed what should have been a great occasion. "I've watched them commit damage, assault my officers and I'm really sickened and disappointed." Manchester City Council had set up three special fan zones with big screens for ticketless fans to watch the match. While screens in Albert Square and Cathedral Gardens did show the game, the one in Piccadilly Gardens failed about 15 minutes before kick-off. With the other two fan zones full, supporters were offered buses to take them to a hastily-arranged screen outside the velodrome at Sports City, near to the City of Manchester Stadium. A police spokesperson said a group of fans in Piccadilly Gardens threw bottles at the screen and then at officers in riot gear, injuring some of them. Questioned on the scale of the police response, ACC Curran said: "At this stage, I do not think there was any heavy-handed policing." She confirmed there were 1,500 officers involved in the security operation, and 300 extra police were drafted in to tackle incidents of violence. Manchester City Council said it would be "holding a full inquiry" into the screen problems. But fans who had been waiting in Piccadilly Gardens all day were unimpressed. One said: "This is absolutely ridiculous - there's Rangers fans throwing bottles and cans at each other because the game's not on. Another supporter added: "The people of Manchester have been fantastic - but the officials behind this are a total disgrace.